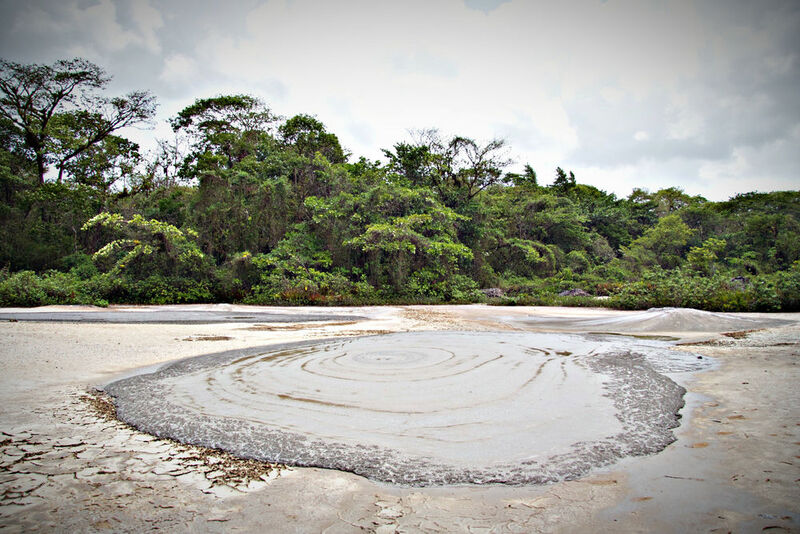 Bouffe: a mud volcano in the middle of a forest. I’d like to dub this year, The Year of the Kapok Tree. When Marketing told me their plans to go looking for a Kapok tree in Trinidad, I lit up. It was a chance to get out of the air condition office, away from the computer and head down south to Moruga — where honestly, very few of us Port-of-Spain town folk actually ever go. 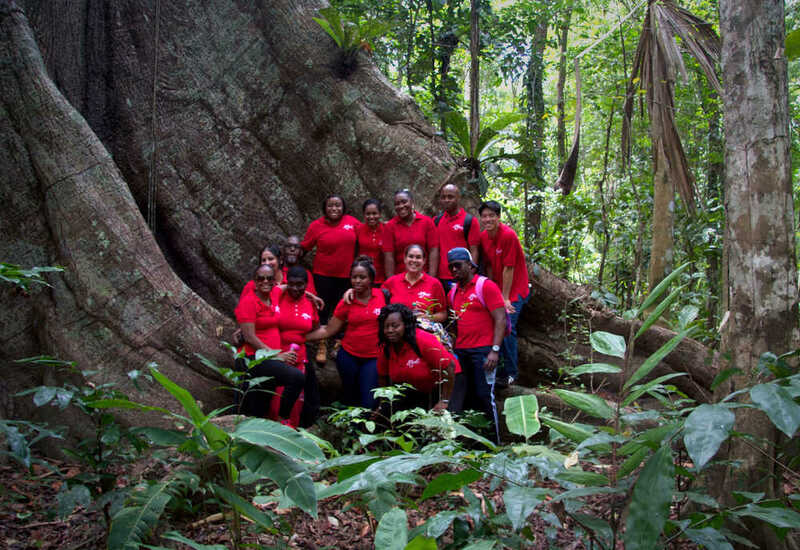 So with the help of Edmund and Derrick from the Trinidad and Tobago Tour Guide Association the Kapok staff piled into a maxi taxi and meandered our way through San Fernando and Princes Town on a mission to re-discover one of the tallest trees in Trinidad, our namesake. 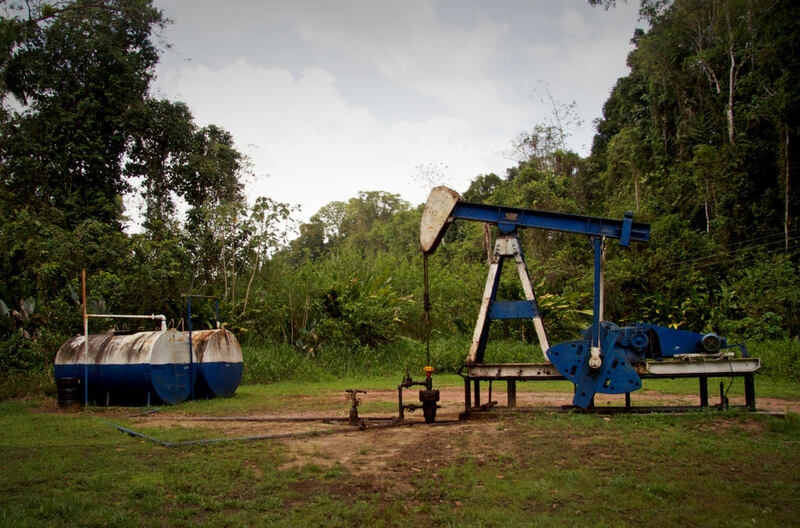 A roughly 2½ hour road trip from Port-of-Spain — the hiking trail is located off Edwards Trace (between Moruga and Guayaguayare), through a Petrotrin checkpoint. 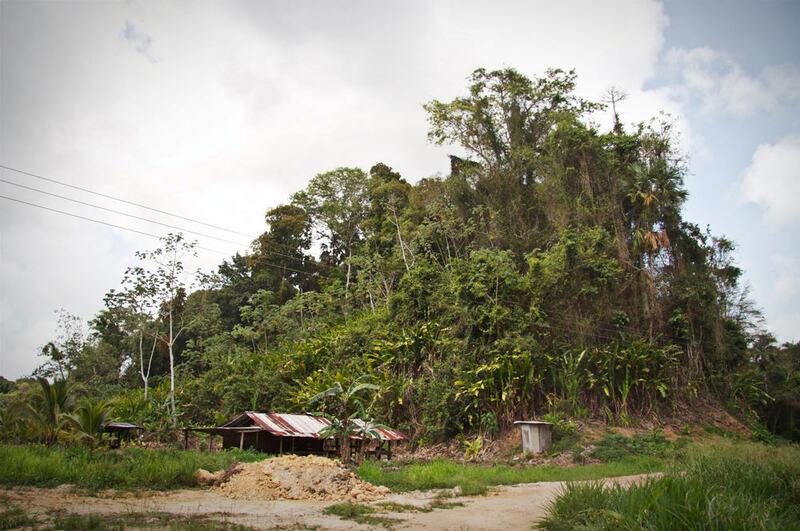 Hunters' camps line the bumpy and dusty old roadway, along with numerous flora or 'bush' that some Trinidadians will recognize as local remedies used in teas and soups (Ex. zeb-a-pik and prickly palm). We pulled up to campsite #31, off-loaded and began our hike on foot. Little is known as to how exactly the hotel got its name. The founder Godfrey Chan (1928 - 1994) was responsible for giving the hotel this iconic name. There is a history however of the kapok or 'silk cotton' tree in Trinidad. It's a native tree that is scattered in the forests of both Trinidad and Tobago — bearing cotton, wood and oil used traditionally by indigenous or the First Peoples of T&T. Commercially in other countries. 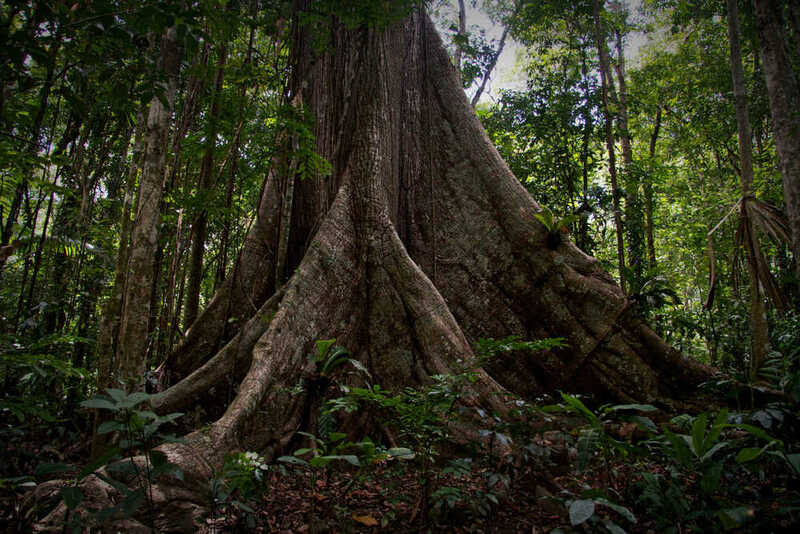 It is one of the largest trees in the country, with the Moruga Kapok Tree reaching taller than 56 metres (184 feet) — the hotel is only about half that size, at approximately 30 metres (100 feet) in height. 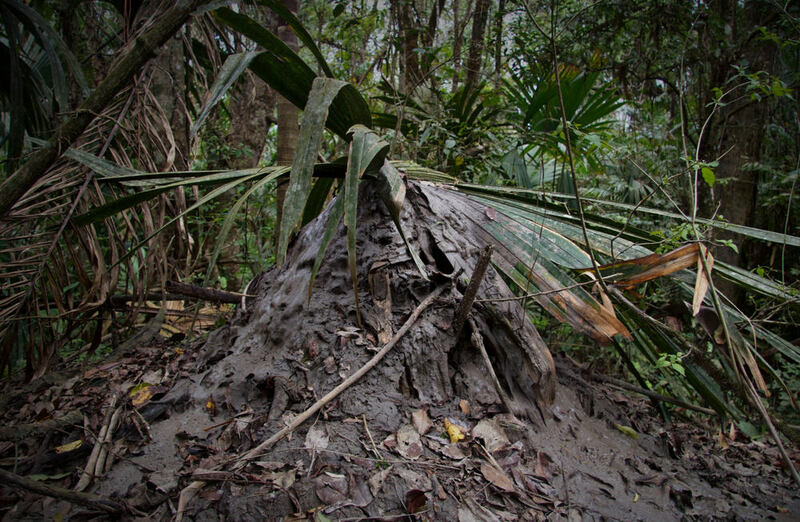 Over the course of Trinidad's history, local folklore has protected this tree. 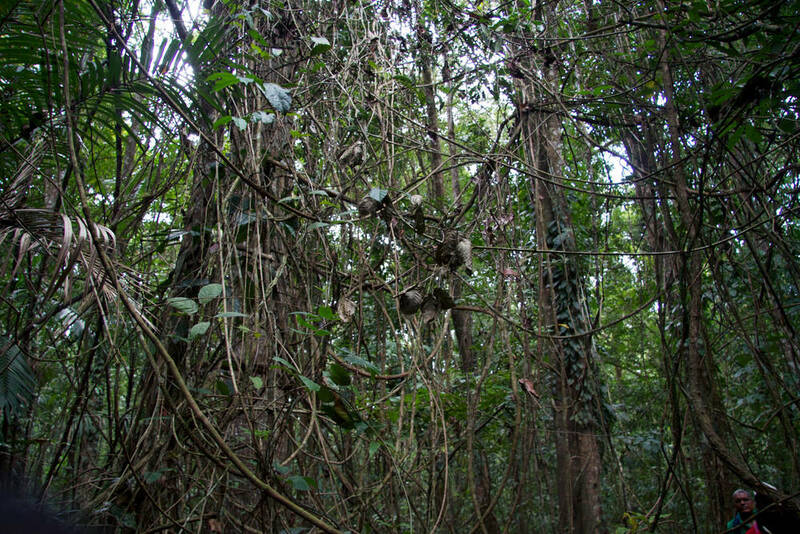 In Moruga, it is believed by the residents that the tree harbours evil spirits or jumbies. Other accounts also find our infamous Douens hiding in and out of the signature buttress roots of this giant tree, helping shoo away hunters to protect the forest. The mythology of the tree spans centuries. Port-of-Spain itself, the capital, having once been an Amerindian village called Cu-Mucurapo or "Place of the Silk Cotton Tree" blending pre- and post-colonial histories and beliefs of Amerindians with generations of Africans and East Indians around this sacred and revered giant tree. Oceans away, the kapok flower (since 1982) is celebrated as the national flower of Guangzhou, China. This is where Godfrey, Kapok Hotel's founder, moved to and grew up as a child, returning to Trinidad at around age 17. The Kapok tree, one might concur, has been a subtle thread in Godfrey's life — in the places he's worked and called home: Guangzhou, Guayaguayare, and Port-of-Spain. Cantonese believe that the Kapok tree has a strong spirit which pushes it to grow tall into the sunlight, a meaningful name for one's legacy. Weary of superstition, but respectful of nature's wonders, we trodded lightly with curiosity, taking selfies and group photos near the towering fortress-like roots of the legendary Moruga Kapok Tree. It was impossible looking up, to see the top of the Kapok tree, with forest vegetation and branches of other trees blocking the view. We regrouped and moved on to our next destination, the Moruga Bouffes. 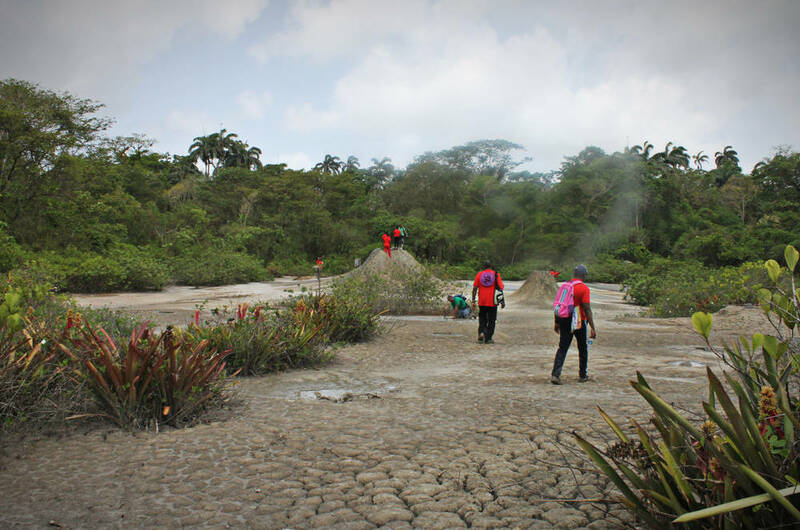 The Moruga Bouffe is the largest tassik or area outside of Piparo (central Trinidad) with mud volcanoes. 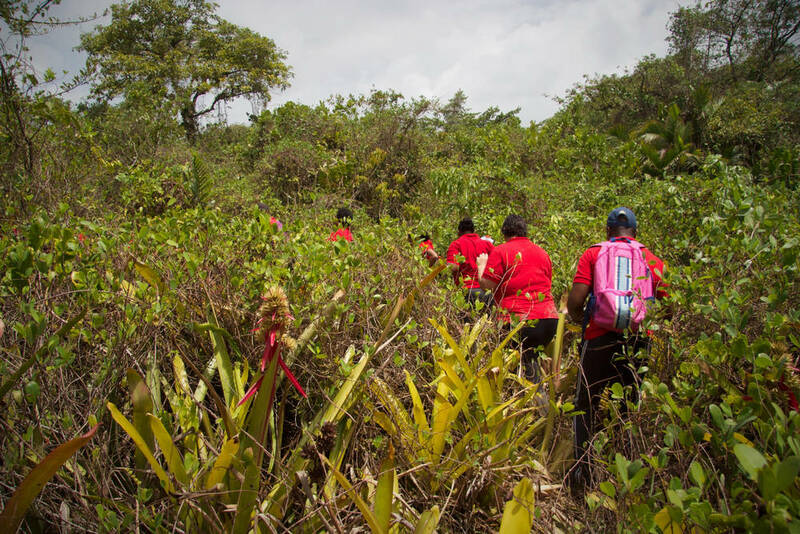 For us, it was a welcomed retreat from the thorny and itchy bush that reached chest deep at times, requiring us to traverse the trail with arms high and sweat marks showing. The Bouffe was anything but that — a great way to recharge and freshen up for the hike back. Very picnic and photo friendly, with lots of cool and refreshing mud to go around. A special thank you to Stephanie and Brenda, who did an amazing job organizing with Derrick and Edmund to create a one-of-a-kind adventure and experience for the Kapok staff. There were no hiccups, the taxis felt safe, and plenty of pelau to fill our bellies. For more information, don't hesitate to contact the T&T Tour Guide Association to arrange a tour or call us at 622-5765 for assistance. We'd be happy to help.